Rain, rain go away! 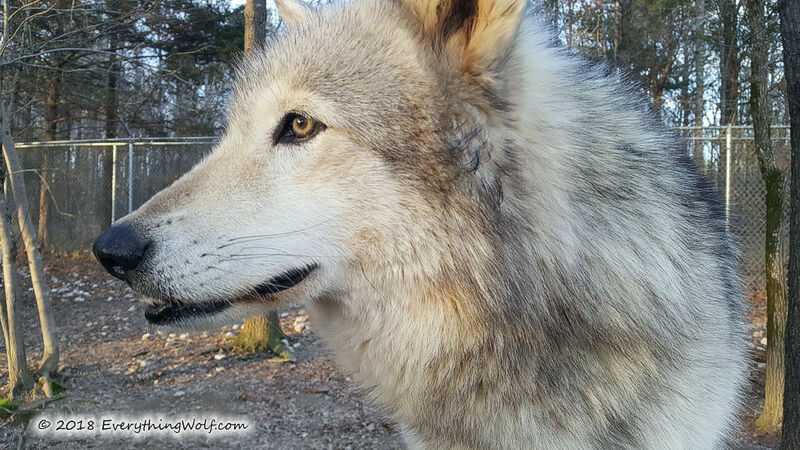 I’m sure that’s what the Wolves are thinking and so am I. It’s a muddy mess in our neck of the woods. We’ve had more rainy days than not this past month. Thankfully, the temps remained above freezing so we didn’t get ice. The Wolves are doing well. It appears that they are returning to normal after the winter’s breeding season. Niko is still in charge. He’s been dominating the food pans which is good since Wa-ta-chee needs to loss a few pounds. Chicken is their mainstay but I always bring other more tempting items in on a daily basis, the good stuff! If you left Wa-ta-chee to his own devices he would finish all the good stuff and not leave any for the other Wolves. When Niko eats first he always leaves some for Woha and Tach. He’s simply not the foodie that Wa-ta-chee is. Woha is naughty as ever. She has taken to going in our pockets and stealing whatever we have in there. 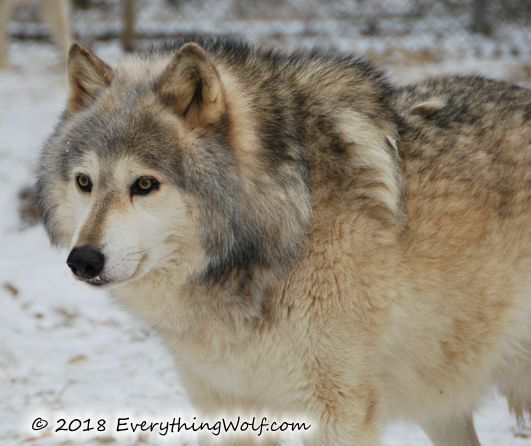 She waits until we are surrounded by Wolves so it’s hard to tell what she’s up to until you see her running away with something in her mouth. Wa-ta-chee is getting a bit friendlier than he used to be. He rarely misses an opportunity to get some good scratches when I’m in with them. Niko doesn’t give him too long to enjoy it though before he’s chasing him away. Niko has claimed me as his. Most times, he doesn’t mind if Woha is getting scratches but just gets mad when I pay attention to Wa-ta-chee. Ohoyo loves her scratches too. She has a bad habit of leaning on the fence when I give her rubs. 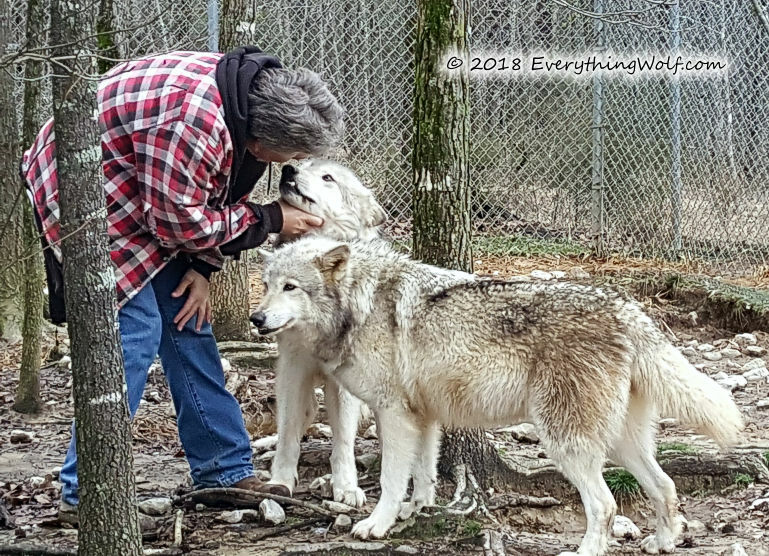 I think she wants the other Wolves to see her getting the attention. Unfortunately, it works and Woha comes up to the fence and tries to bite her through it. She also sticks her paw through the mesh to try and grab Ohoyo. Then the fence fighting begins. Girls! 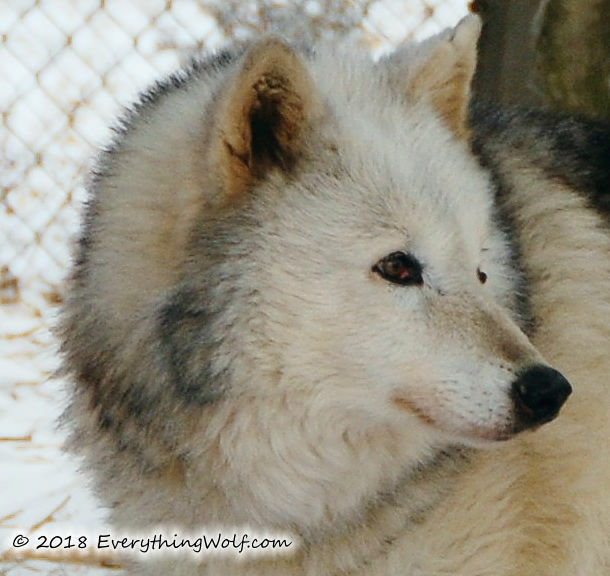 I’ve added some new pictures to the Wolf Picture Gallery on our website. I had trouble this month uploading a howling video to YouTube so I didn’t embed it in this article. I tried uploading it 4 different times and each time the sound and video were a bit off. Here’s the link and hopefully it will play right for you.